These entrepreneurs admit they thrive on their work addictions. For Brian Kurth, a six- or even seven-day workweek is nothing unusual. In fact it's the norm for the 41-year-old business owner, who also admits he doesn't get much sleep. "I'm usually up until midnight, and back up at 5 a.m.," says Kurth, owner of Portland, Oregon-based VocationVacations--a company that allows people to test-drive dream jobs. "But it's not work if you love it." That's the mentality shared by many entrepreneurs eager to grow and build their small businesses. It makes sense when you consider that entrepreneurs, by nature, are hard workers. That's not a bad personality trait to have, but unchecked it can consume entrepreneurs. When that happens, a reliable, hard worker can slowly morph into a burnt-out workaholic. 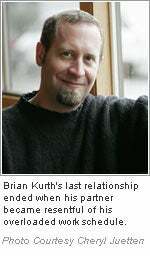 Kurth learned this lesson the hard way. He broke up with his partner at a point in his career when he was juggling his new business, writing a book and trying to maintain a relationship. "Something had to give," he says. "But I'm not willing to be a workaholic at the expense of being single the rest of my life. It's important to find that balance in life." Though the word workaholic tends to have a negative connotation due to the health and social implications associated with it, some entrepreneurs insist it's a lifestyle that works for them. "I absolutely love what I'm doing," says Scott Badger, 37, founder and president of KPI Direct, based in Portland, Maine. "I have no regrets." Mobile technology makes it that much more difficult for workaholics--also described as Type A personalities--to unplug. 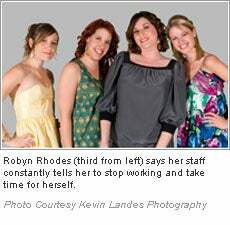 Jewelry designer and entrepreneur Robyn Rhodes, 30, can attest to this modern addiction. "I sleep with my BlackBerry close by. Sometimes I wake up in the middle of the night to see what's happening," says Rhodes, who started her Studio City, California, jewelry company, Robyn Rhodes, in 2002. Rhodes says the company had sales of more than $350,000 last year and is projecting $500,000 for 2008. Likewise, Badger responds to client communications day and night. Due to the nature of his business--which counsels organizations on how to create multi-channel direct marketing programs--Badger finds he's unable to switch into "off" mode. The hard work has paid off, however. 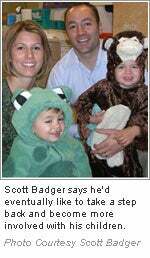 Since 2006, Badger says the company doubled its employees and tripled its monthly revenue. "With clients across the globe, I'm tempted to do business at all hours," Badger says. For entrepreneurs like Rhodes and Badger, the thought of leaving their business for even one week sends chills down their spines. "If someone told me I had to take a week off, I'd freak out," Badger says. "I wouldn't enjoy myself at all." Rhodes admits she hasn't taken a week-long vacation since the inception of her business. In fact she doesn't even have a valid passport. "My goal for 2008 is to get a passport for a European vacation," Rhodes says. "But right now I feel like I can't leave the business for too long." Many entrepreneurs also resist delegating to others, making it that much more difficult to take that week-long trip. "Letting go is hard," Badger says. But it's something he's working on--Badger just hired someone to help manage aspects of his business from Atlanta. Relinquishing control of duties is a necessity for many entrepreneurs striving to find work/life balance. For Kurth, it's all about setting rules and sticking to them. "The minute [my workaholism] impacts family or friends in a negative way, I draw the line." Rhodes and Badger have been finding that balance. Rhodes made the first move by relocating her business out of her home and into an office space. "I needed to separate my business from my life," she says. Meanwhile, Badger balances his intense schedule with his additional roles of husband and father of two. Though it's a struggle, Badger says he finds ways to make it work. For instance, to spend more time with his children, Badger is working on limiting his travel to four days a month. He also created summer office hours, closing the door at noon every Friday. "Last year, I picked up my preschool-age boys and headed to the beach. It was amazing." According to psychologist, professional speaker and trainer Dr. Jack Singer, it's important for Type A personalities to have an outlet, be it a hobby, a sport or a therapist. When Badger's feeling close to burn-out, he escapes for an afternoon to watch a movie solo. Rhodes relieves her work-related tensions by exercising and cooking. For Kurth, a change in environment can make all the difference in his mental health. His solution is to pack up his laptop and escape to a scenic location about an hour from his office. His "secret spot" is located in a county park where he can do business amidst the picturesque backdrop of Mount Hood and Mount Adams. Integrate relaxation into everyday activity. Get away from everything--even your phone. Pay attention to family and/or your support system. Exercise to break down tension and stress. Communicate openly with those closest to you. Entrepreneurs may attempt to be superheroes, but when it comes down to it, they're only human. The constant stress that comes along with nurturing a growing business can be taxing. Badger, Kurth and Rhodes can attest to that. But they're also proof that being a workaholic isn't a death sentence. "'Workaholic' can have a negative connotation," Kurth says. "I'd like to think of it in a positive sense; that I'm doing it because I love my product and I love the folks I'm working with." If any of the stories above sound familiar, consider getting some help--as difficult as that may be. "Most Type A people don't get any help until after experiencing their second heart attack," Singer says. Singer, aka "Dr. Jack," is the president and CEO of Psychologically Speaking, based in Laguna Hills, California. Singer coaches local entrepreneurs and high-powered CEOs, and provides phone therapy for out-of-towners seeking help. To find out if you're exhibiting workaholic traits, look at the checklist below. "The more items that apply to you, the greater the chance you fall into this workaholic/Type A syndrome," Singer says. If you do find yourself checking off multiple symptoms, Singer recommends you seek help to avoid potential burn-out.